BUENOS AIRES, Dec 16 2017 (IPS) - What are the contributions of migrants to trade, to the economy of their countries of destination and origin? This is an angle that is generally ignored in the international debate on the subject, which usually focuses more on issues such as the incidence of foreigners in crime or unemployment. In order to discuss these and other questions, international experts met in Buenos Aires on on Thursday, Dec. 14, at the first Forum on Migration, Trade and the Global Economy. Not coincidentally, but to highlight the links between both topics, the event was held a day after the end of the 11th Ministerial Conference of the World Trade Organisation (WTO), also held in the Argentine capital. “Migration is treated today in the world almost as a police matter. We stress the need to address the issue a different way, analysing the favourable economic outlook, especially in international trade,” said Aníbal Jozami, president of the Foro del Sur Foundation. 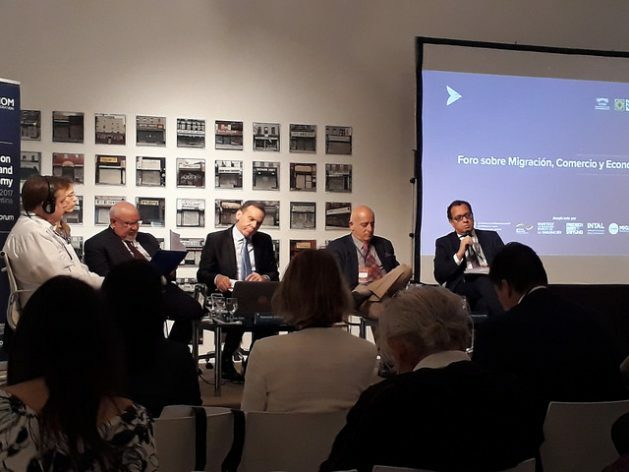 This Argentine non-governmental organisation, which promotes diversity, organised the event together with the Geneva-based International Centre for Trade and Sustainable Development and the International Organisation for Migration (IOM). There are some 244 million migrants in the world today – around three percent of the total population – according to figures provided by Diego Beltrand, the IOM regional director for South America. The number of migrants grew by an estimated 300 percent over the last 50 years. Different kinds of evidence of their economic contribution, something that is usually ignored, were presented at the forum. According to a study presented by the IOM during the forum, migrants contribute nearly 10 percent of the world’s GDP and are especially helpful to their countries of origin at times of economic crisis through remittances, which exceed 15 percent of national GDP in countries such as El Salvador and Honduras. The IOM also estimates that migrants generate six trillion dollars worldwide. Meanwhile, the remittances they send to their countries of origin reach 15 billion dollars per year, according to Resedijo Onyekachi Wambú, from the African Foundation for Development. Another prejudice challenged was that most immigrants aspire to very basic jobs. Stefano Breschi, a professor at Bocconi University in Milan, Italy, revealed that in the last two decades, high-skilled migration grew by 130 percent against an increase of just 40 percent for the low-skilled. Manke is a Russian woman married to a German man. She emigrated to Germany, which she visits every weekend as she now works in the Swiss city of Geneva. “My family in Germany see a large number of migrants in Berlin and it worries them. We need to be patient. Maybe there is a negative impact in the short term but over long periods migration is a broadly positive phenomenon,” she told IPS. The event was held in the old Buenos Aires Immigrants’ Hotel, a building near the port which has been turned into a museum. In the late 19th and early 20th centuries, the Argentine government gave free accommodation there to families who had just arrived after long sea journeys. Thus, between 1881 and 1914 more than four million foreigners arrived, who represented more than a quarter of the population in 1895, as can be read in the museum. The majority of these immigrants were from Italy, Spain and other European countries. Today things have changed, and Europe is the destination sought by millions of immigrants as it tries to close its borders. “In the debates related to Brexit in the UK, for instance, the narratives that migrants take our jobs or abuse our welfare were not supported by the data,” the Slovak expert told IPS. South America, on the other hand, received praise for its recent immigration policies. Since 2009, efforts were made to strengthen the regional integration process with freedom of movement agreements for citizens of Argentina, Bolivia, Brazil, Chile, Colombia, Ecuador, Paraguay and Uruguay. This made it possible for more than two and a half million citizens from other countries in Latin America to obtain residency permits, according to data from the IOM Regional Office for South America, based in Buenos Aires. In the case of Argentina, the National Director of Migrations, Horacio García, said that since 2012, more than 1,350,000 residence permits have been granted. García, however, warned that it is necessary for the State to get involved in the integration of immigrants into the labour market, a topic that today is being neglected. “It is necessary to identify those regions of the country where there are job opportunities, so so they can contribute to development, their skills are used and the pressure is taken off urban areas,” he said. Like other countries in the region, Argentina recently received large numbers of immigrants from Venezuela who are fleeing the economic, political and social crisis in that country. Argentine sociologist Lelio Mármora, who specialises in migration questions, estimated that in the last year and a half alone, some 40,000 Venezuelans have settled in Argentina. “Everyone applauded the fall of the Berlin Wall and today we have about 20,000 kilometers of walls and fences that prevent people from passing from one place to another,” he complained.